If you’re opting for a traditional wedding registry of items for your kitchen and home, the focus is naturally on the stuff your list contains — the items, brands, costs and quantities. 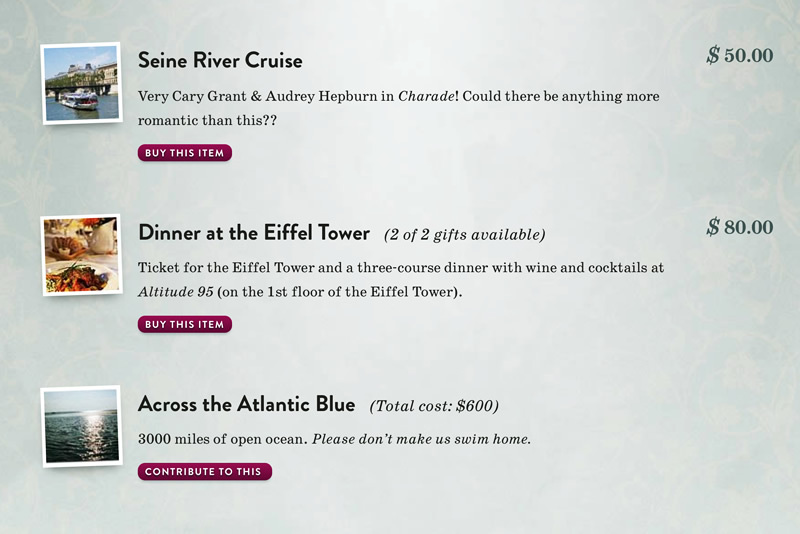 But the same rules don’t really apply to a honeymoon gift list. Instead, you’re telling the story of your honeymoon plans, inviting your guests to engage with the romance and personal value of their gifts to you. Of course, you can make your list as simple or as detailed as you wish — you don’t have to know your itinerary in advance. But even just a contribution towards your airfare isn’t like buying a wine glass from a shop. This is why our service needs to be so flexible. And even though we’re not the only independent honeymoon gift list service, there are a bunch of things we offer that no-one else does. Your registry might contain a variety of different types of gift. Maybe you’re planning on taking a sightseeing tour. You’d like that to be bought only once — so when someone’s reserved, it becomes unavailable for other guests. But you’re also hoping for a couples’ spa treatment while you’re away, which you’d prefer to split in half into two gifts. When one’s bought, the other’s still available. When they’re both reserved, the whole thing is shown as sold. And maybe you’d like to include a champagne fund on your list as a smaller item. There’s no limit to the number of times you’d be happy to receive that as a gift! As for your flights, that’s a big cost — but any contribution towards it would be an amazing way to help make your honeymoon happen. You wouldn’t want to have to suggest a value; any amount at all would be gratefully received. Buy Our Honeymoon makes it easy to combine all these different types of gift on the same wedding list. And we even include a way for guests to provide their own gift suggestion! With Buy Our Honeymoon, you can divide your list into any number of custom sections and display the items in each category in any order you wish. Perhaps you’d like to break up your list into the types of gift — meals out, travel expenses, hotels — or maybe you’re visiting more than one country and want to show different items for each. You can shape your list however you want. And we give you loads of room to show your personality. Each registry has an introductory page as well as a list page, with your own words on each. You can change the title of your list. You can provide as much description for each item as you’d like, and even include simple formatting and links. Our customers in the UK have benefitted from this for more than a year now, and it’s very soon coming to our friends across Europe too. With Buy Our Honeymoon, you’re able to offer guests the option of making a easy and secure online payment straight into your own bank account using a one-off Direct Debit. A little more than a third of the online gift payments facilitated by our site last year were completed using one-off Direct Debit, with thousands of pounds saved in transaction fees. Let’s say you’re travelling from the UK to the Maldives — perhaps you’d like to show the cost of each gift in both Pounds Sterling and Maldives rufiyaa. Or maybe you each have family living in different parts of the world, so you’d like to put together your list in pounds, and show each cost in Euros and US Dollars as well. With Buy Our Honeymoon, you can. You can use one currency for the gifts on your list, and a further two display currencies if you wish, and we’ll take care of the rest. We have 36 different currencies available, and update all the conversion rates each day. If you choose to set up online card payments through PayPal, you can even select any of the currencies PayPal supports, and we’ll make sure your gift payments are made in that currency. And not only do we support multiple currencies, you can also have your registry appear in English and up to two other languages. This is really useful for couples with international family and friends: your wedding guests can view, reserve and pay for items on your registry wherever they live. We have translations available in French, Spanish, German, Italian, Portuguese, Swedish and Dutch. We were the very first service to offer a variety of rich, ad-free, designs to complement your honeymoon gift list. And this summer, we rebuilt and refreshed all of them to bring them totally up-to-date with the modern web. 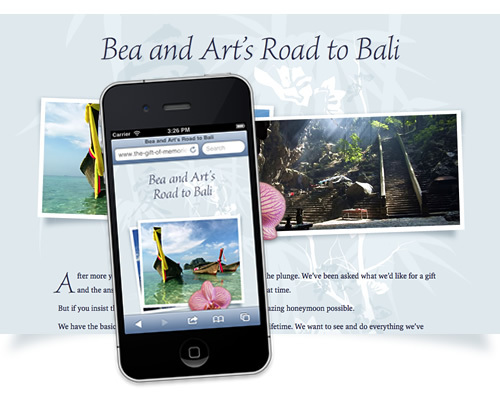 We’re now the only honeymoon registry with themes that adapt seamlessly to mobile devices like the iPhone or iPad. Your guests can use your list easily and conveniently wherever they are — and they’ll get the full experience, not just a watered-down mobile version of the site. We’ve had tens of thousands of couples using our honeymoon gift list service, with honeymoon destinations all over the world. We’ve even had couples spend their honeymoons in places as far-flung as the Himalayas and Antarctica. So, although we may not have everywhere covered, there’s a fair chance that wherever you’re headed, you’re in good company. With our unique Helping Hand service, we’ll find the very best list that covers your honeymoon destination, and copy over the items from that list to yours. We’ll make sure that the items are depersonalised and relevant, giving you a ready-made wedding list that you can then edit and customise to your heart’s content! You can try out all the features of Buy Our Honeymoon for one week with no obligation and no fee. And if you have any queries about the service we provide, please do contact us at any time! Not sure yet of your honeymoon plans?